Pretty pumpkins with no fuss and no muss. Skip the carving and messy clean-up this year — give your pumpkin personality with decorative and stylish ribbons. Carving a jack-o-lantern with the family always seems like a good idea at the time. But it often ends with the kids getting bored and mom or dad left doing all the work…and all the clean-up. Our solution? Ribbons, of course! Ribbons are a simple and chic way to dress up a pumpkin without the mess of carving. Read on for a few of our favorite no-carve ways to decorate pumpkins for Halloween. Loop a hair tie or rubber band around the stem of the pumpkin, then feed the end of your favorite autumn-toned ribbon through the band to start, leaving enough of a tail so that you can tie a bow at the end (we like a nice creped or wired organza ribbon for a super stylish look). Then, wrap the ribbon around the pumpkin vertically seven to nine times, depending on the look you’re going for. Make sure to thread the ribbon through the rubber band on the stem each time to keep it in place. Once you’re finished wrapping, tie a fancy bow at the top and embellish with a couple of small pine cones or a leaf spray. Start with a white pumpkin (or paint your pumpkin white if you can’t find one!). Hot glue a silver or rhinestone chain into the shape of a spider web, using the stem as the center of the web. Add on a giant spider (painted silver for good measure), and you’ve got yourself a glamorous and festive pumpkin! This pumpkin idea is even easier than the last! Simply wrap a black mesh ribbon or tulle around a darkly painted pumpkin and tie it off with a black bow. For added effect, drape a black leafy garland around the pumpkin, or add some spiky studded ribbon, for the perfect goth-inspired Halloween pumpkin. Who doesn’t love polka dots? Grab your chosen pumpkin, an assortment of Halloween polka dot ribbon, and a few thinner grosgrain ribbons, and go crazy. Vary the ribbon width and polka dot sizes for a fun and festive design. Top off the pumpkin with a fun feather puff. 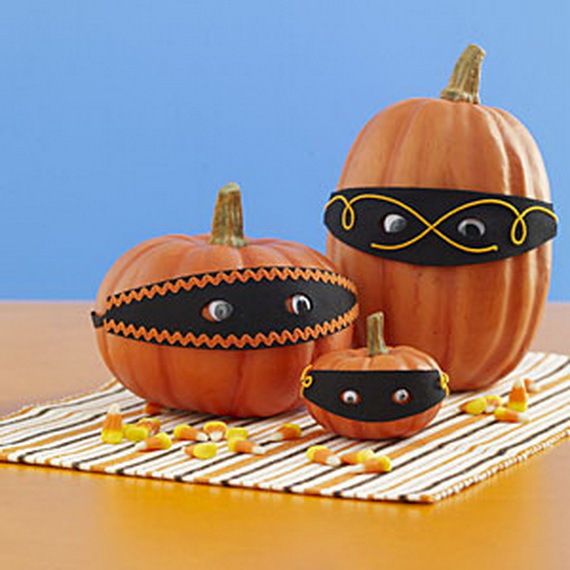 For an adorable no-carve take on the jack-o-lantern, select three pumpkins in various sizes and give them Zorro-style masks. Design and cut out the masks from felt, making sure to leave room for the googly eyes you’ll glue on later. Then decorate the masks with colorful yarn or fun ric rac trim. Glue on the eyes and masks, and watch your trick-or-treaters’ faces light up when they see your beastly bandits. Why decorate just one pumpkin when you can have an entire bowl of them?! Select six to eight small pumpkins of varying colors to fill up a rustic wooden serving bowl. Choose several patterned ribbons within the same color scheme (like orange, white, and black). Then simply tie or hot glue the ribbons around your mini pumpkins and arrange them inside the bowl for a beautiful centerpiece or coffee table display. Now that you have a little pumpkin inspiration, it’s time to get decorating! Bring a new twist to your Halloween décor this year with fun ribbons and trim.